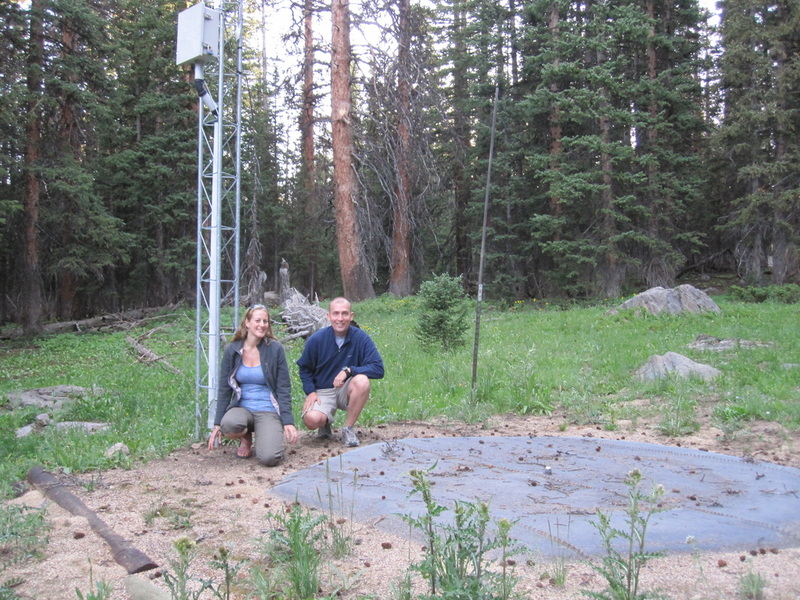 Our current research efforts are funded by the State of Wyoming and we are evaluating the impacts of weather modification (cloud seeding) on streamflow. We are partnering with the National Center for Atmospheric Research (NCAR) and the University of Wyoming Department of Atmospheric Sciences. A ground based weather modification generator in Wyoming is pictured above. Please refer to publication #17 (Acharya et al., 2011). United States Department of Agriculture (USDA) Natural Resources Conservation Service (NRCS) Snow Telemetry (SNOTEL) site (Brooklyn Lake, Wyoming, USA). Snowpack data (snow water equivalent) is collected on the "pillow" and provided electronically via the USDA NRCS website. This site is in the Medicine Bow range and is at elevation 10,240 feet (3,121 meters).